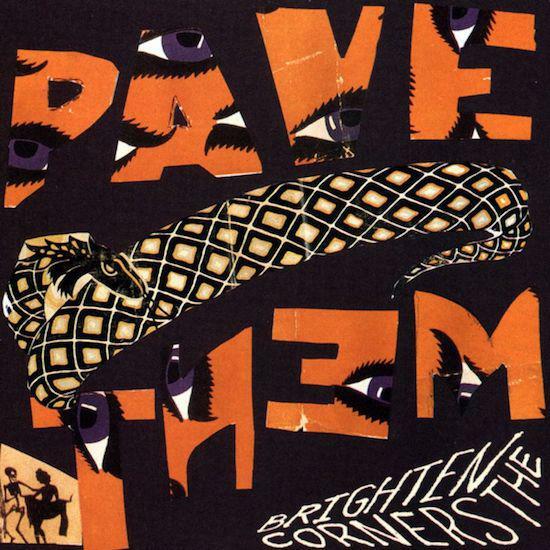 Was Pavement′s Brighten the Corners the most lyrically inventive record of the 90s? This famously verbose album, with its dual approaches to language – sublime lines followed by throwaway quips, austerity offset by the need to jam in more and more – remains a puzzle. Stephen Malkmus′ approach is to treat words with immense care and then nonchalance: if he needs to kill time before a chorus, he′ll hammer every syllable home, so that you know the phrase has been cut to fit the metre. On the other hand, the rhythm of an entire verse can be distorted to showcase an attractive word such as ″terrarium″ or ″guillotine″, making an otherwise strict line burst at the seams. The point is that this record is constantly changeable, moving between tones and styles as if on impulse. Lyrics can be irreplaceable, or they can come as deliberately mundane and colourless as ″summary acts″ or ″lumbar pain″. Narrative is also optional: the album cycles through a number of classic tropes, from chic rock-star misogyny to plaintive country to the blues, each genre milked for its imagery and chord structures, then given a final kiss-off. The key here is mismatch: crooning sweetly is acceptable if the subject is esoteric, while the blues are best paired with a banal topic such as admin or logistics. The first track, ′Stereo′, jumps from mood to mood as the narrator is torn between idling thoughts, digressions and the tortuous business of being an indie radio star. There are massive fluctuations in energy levels, from the languorous, loose-mouthed opening (″Pigs, they tend to wiggle when they walk″) to the goofy bass to a smashing chorus which rhymes ″malaria″ with ″hysteria″: a parody of Kurt Cobain′s ″a mosquito, my libido″? Malkmus has always mocked grunge and its simplistic pairing of power chords with grinding pain; here, consumer rage is ironised to the point where it can build up and die off within seconds, in time for the next verse. If ′Stereo′ deconstructs the mechanics of rock, then ′Embassy Row′ is as close to the sound of a monster hit as Pavement will get. Malkmus has described it as a song Offspring fans could enjoy – a put-down if there ever was one, but also a way of writing off what he refers to as his ″clichéd melodic sense″. Along with digs at other bands, Malkmus enjoys satirising the faint hints of commercial potential in his own work: the turbo chorus concerns something as arcane as the ″netherworld of foreign feeds″. The singer′s most ardent delivery is reserved for the plain and the inscrutable – the type of stylised blandness we today call normcore. A dry subject – bureaucratic red tape between envoys – is decked out with thrills, intrigue and paranoia à la Thomas Pynchon. Identity and nationality are unstable, sacrificed to the potential of enticing words (the new accent on ″I needed a visa″ supplies the foreign context and rhyme for the next line, ″I bought off a geezer″). ′Embassy Row′ opens with dawdling guitar and an exhausted Malkmus barely eking out the lyrics. Language has slowed to a crawl, with letters unhooked from words, as an ″A for effort″ gives way to a ″C for devotion when the world starts encroaching″. This staggered slowness prepares us for the lift-off of the chorus, but it is typical of Brighten The Corners that songs get infected with writerly fatigue. ′Type Slowly′, the album′s epic number, encourages us to think of its lyrics as rote, dictated or transcribed – anything but spontaneous. In this song, language is a typewriter which sometimes malfunctions – for instance, stamping an ″I″ at the end of a sentence for no obvious reason. As the title suggests, words now carry excessive weight for the author – even depressing a key involves a monumental struggle of will. Throughout the album Malkmus uses weariness as a conceit, seeing it as a condition of men in different situations: an ageing cowboy, a musician jaded by corporate structure, and a guy whose relationship is breaking up. Perhaps the overwhelming feeling is of lateness as much as age or decay – the idea of being born post-greatness, past the age of genuine urgency or originality. Despite the opacity of language, ′Type Slowly’ carries the emotional reality of a failing relationship: ″One of us is a cigar stand / And one of us is a lovely blue incandescent guillotine″. This pairing of two ready-mades recalls Marcel Duchamp′s phrase ″the chance meeting on a dissecting table of a sewing-machine and an umbrella″, especially since Malkmus references Futurism later in the track. As for Duchamp, devices are heavily coded as male or female depending on the poses they suggest. If Malkmus′ exaggerated macho resembles a ″cigar stand″, no prizes for guessing who′s the slicing death machine, all the more for being lovely and incandescent. These are simply two irreconcilable objects, meeting on the table for one last time. ′Type Slowly′ is full of these ″ready-made″ displays, making familiar moods and rhythms strange by putting them in new contexts: humour stems from the mismatch of language and tone. When Malkmus sings with tender nostalgia, it′s for a phrase like ″Trolls in the glen are consorting again.″ At the end, he adopts a wise, instructive air, as if dispensing sage advice, to deliver this impenetrable line: ″Frozen images, respected few, type … slowly.″ The hesitation before ″slowly″ is a form of comic suspense: what non-sequitur will come next? The pauses on this album are about turning the unexpected into the expected: priming you for a pun that may never come. On ′Type Slowly′ and ′Transport Is Arranged′, Malkmus bluntly addresses the listener as ″lady″ – a parody of sexist but suave attitudes heard in several tracks. Therefore it′s a surprise when, on the single ′Shady Lane′, he gives a shout-out to ″Oh her god″ in addition to ″his god″ and ″my god″. This gesture is in the spirit of the song′s sunny generosity, although it is also a form of pedantic list-making. In this song, being inclusive can mean cramming in ever more adjectives and detail. Each time we lead up to the chorus, the final line is ridiculously lengthened: ″You′ve been chosen as an extra in the movie adaptation of the sequel to your life″. An analogy is strung out until it becomes untenable: like Malkmus′ deliberately forced rhymes, this is about making the gnarly foot fit the shoe. During the bridge, the guitar must patiently wait to accommodate this sentence: ″Tell me off in the hotel lobby right in front of all the bellboys and the over-friendly concierge″. The sudden, irrelevant blares of anger on ″movie adaptation″ and ″bellboys″ show us how random injections of passion can jump-start the most unwieldy lines. Packing so much into a verse recalls the postmodern novelist′s habit of tagging prose with endless footnotes, making a fetish out of fact-checking. Carly Simon did something similar to less acclaim, when she squeezed the words ″strategically″, ″apricot″ and ″gavotte″ into ′You′re So Vain′, as well as this lengthy tirade: ″And when you′re not, you′re with some underworld spy / Or the wife of a close friend / Wife of a close friend.″ That sentence could pass for a Pavement lyric, straight out of ′Embassy Row′, even if Simon′s critical reputation is much less secure than Malkmus′ – Robert Christgau has dismissed her writing as ″overblown″, with ″numerous syntactical awkwardnesses″. But in truth, Pavement′s work is about nothing if not ″syntactical awkwardness″: getting mileage out of impossibly convoluted phrases, and then proposing new rhythms to match them. Over the years, Malkmus has cultivated the persona of the emotionally evasive thinker, the one who historically preferred vapid girls ″because you′re empty and I′m empty″. As a songwriter, he wore this blankness proudly: a kind of immaculate deadpan similar to that of pre-Late Show Stephen Colbert and Roy Lichtenstein (whose self-portrait famously consisted of a mirror reflecting nothing). In a 2014 interview, he spoke of the tremendous strain it took to describe love as ″terrific″ instead of ″horrific″. For a wit like Malkmus or Colbert, the thought of making a straight or literal comment is mortifying. Faced with a sea of earnest listeners, these men instinctively speak in codes and double-talk. ′Old To Begin′ represents the fullest exploration of this persona, since its lyrics come dangerously close to an actual relationship description (″You get to feeling like a fixture, set in 1966 / Time came that we drifted apart″). A sweet melodic catharsis comes on ″drifted apart″, but such a warm flood of feeling naturally requires some kind of armouring in response. If anyone thought they were getting a glimpse of the artist′s personal life, this should be refuted by the mention of 1966. One can hardly imagine Malkmus singing with such intensity about, say, 1996: quarantining the past frees up expressive involvement, allowing the narrator to dig deep in the name of character. ′Old To Begin′ is the most nakedly emotional song on the album; while its lyrics are typically self-reflexive, the track is open about the difficulty of not sounding glib. ′Transport Is Arranged′ features this sort of bait-and-switch, in which the promise of disclosure is whisked away by artful language. The narrator sings fondly, ″I know you′re my lady″, but then immediately segues to ″I could trickle, I could flood″ and a series of arresting rhymes which trail away from the original subject. So many of the songs are flashes of introspection disguised by verbal quicksilver: a quick move into cryptic speech any time a revelation might be forthcoming. Malkmus will often mount a convincing narrative before disclosing that it is entirely a pretext for rhyme. In ′Starlings Of The Slipstream′, the protagonist puts a spy-cam in a sorority: a dodgy act until we realise that its purpose is to create a rhyme with the title, ″darlings on the split-screen″. Language is a tool to make images multiply, breaking them up into sounds and letters. At one point, the singer claims to be intimidated by polished speech: ″The language of influence is cluttered with hard, hard Cs.″ Those ″hard Cs″ are the jargon of politics and academia, which promotes its own aesthetic, so that a lecturer might say the word ″dialectic″ just to hear its satisfying double click. But the album clearly relishes the disintegration of words into shiny puzzle pieces, from the attempts at grading in ′Embassy Row′ to the authorial sign-off on ′Blue Hawaiian′ (″When the capital′s S, it is followed by a T, and it’s probably me″). Brighten The Corners follows the slipstream of language: it is guided by verbal associations, falling into a new tongue or tone any time a phrase seems to demand it. These shifts are tied to the nuances of the singer′s voice. Critics of Malkmus′ vocal limitations should note that he often sounds purposely feeble, struggling to reach the ″heights″ he did only a second ago. In any case, Pavement′s songs would be meaningless with a performer of vast range and power, someone who could ride smoothly from A to B instead of taking the jagged, meandering path. After all, what use is a voice that doesn′t break six times before its apex? Who else can make the word ″dead″ drag across three syllables and an octave? Malkmus′ voice wavers and cracks even when it doesn′t need to – for him, language is so stretchy that a line can be drawn out interminably, or instantly shrunk down to size. When he sounds aggressively casual, or starts to belt without warning, we see how easily he can flip the mood of a song from warmth to foolishness, sleaze to maturity. This album is about stringing together clichés in unpredictable ways: delivering a killer chorus before flatlining, alternating passion with puns, tugging the heart-strings only to clam up. Surrounded by a surfeit of options, Malkmus chooses them all.